So, Thursday I visited 'the mad scientist' for my 11 week post-op check-up. I had been feeling so good the past two weeks that I came braced to win him over with my "I'm gonna walk outta here in sneakers" argument. Before he even entered the room, I had unpacked my shoes and put them on the floor beside my bare foot as a visual reminder; I was prepared! Luckily over the nearly two years that I have been Dr. W's patient, I've been able to train him on how and when he should listen to my pleas, so it didn't take too much case-making on my part. However, even as late as a year into our relationship (and yes, I call it a relationship because we really act more like an old married couple now than we do a doctor and patient), he would still peer over his clipboard with his all-knowing arrogance (even he won't deny he is arrogant) and tell me how he knew best and how I should only follow his instructions. We've come a long way since then. . . So to celebrate the "balancing act of expressing all the excitement of walking with not overdoing it" and the wedding I am attending in two weeks, I decided to attempt a "pretty shoe" shopping excursion today; a first in a long time. I had my morning perfectly planned! I rose early, knowing that I needed to try on shoes early in the day to avoid major swelling (or else there was no hope of even getting them on) and of course the large crowds at the store. Needless to say, my plan was foiled on both accounts. It only took a matter of minutes for the right ankle to become the size of a grapefruit while I stood in the kitchen making my pancake breakfast. I did manage to constrict the swelling a bit with an ace bandage, but by the time I had eaten, showered, and dressed, it was nearly 12pm and I was running late! I arrived at DSW shortly after noon and the store was swelling with springtime shoppers. Today was the first day of really good weather this season so everyone was out (everyone, their babies, their dogs, and their cousins, that is). I strolled the sandal aisle dodging fellow shoppers here and there in the hopes of finding an open-toed beauty that would both match my brightly colored dress and also have enough room for my larger than life foot and tightly wound ace bandage. After a few attempts, I quickly figured out that my only viable choice was a glittery pair of thongs. And, I wasn't prepared for one minute to pay more than $40 for a pair of thongs! So, after shoe style reductions and price restrictions accounted for (making a choice truly is easier when your selections are narrowed down for you, wouldn't you agree? ), I had found two pair that I could actually fit my foot into and that seemed to be a match for my dress. I took the boxes and walked over to the register line. Unfortunately, I had to keep walking and walking (well, limping and limping) because it appeared that the line was now wrapping around the entire store! Knowing there was no way that I could stand in that line long enough to pay for my purchase, I had no choice but to leave without anything in my hands . . . Reluctantly, the pursuit continues . . . The Open Road . . . I continue to feel good in the boot, really good. . . I took my first post-surgery trip this week to Toronto for business. Luckily, the flight is only a short hour from New York, so the swelling remained low. I opted for wheelchair service, not because I can't walk well enough, but only because the Toronto airport, with its long hallways and distant gates, could probably be considered training grounds for marathon runners. . . in fact, their wheelchair transport staff seem to be in training for a relay event. I felt like a baton being passed from driver to driver around every new corner and elevator bank. It took 4 different persons to bring me from my gate to the customs arrival area! After a long delay at La Guardia and lots of sitting and waiting between relay runners at Toronto, I finally made it past customs and out to the rental car desk. . . yes, I was not only taking my first flight post-surgery, but I was also going to attempt to drive a car for the first time--in a foreign country no less! After chanting to myself non-stop for the previous 24 hours "don't forget to pack your right sneaker", I dug it out of my suitcase, laced it up, and climbed into the Ford Focus. "Well, let's see how this feels" was all I could think to myself as I started the engine, gave the car a little gas, and backed out of the parking space. And, as I entered the highway and reached higher speeds, it turned out I had nothing to fear after all. . . my foot was strong and I felt confident the entire time I was driving, even in stop and go traffic. The last few weeks of living in the boot have been relatively easy. Knowing exactly what to expect this second time around has definitely helped to keep my patience in check, but overall the healing process has been both faster and easier on the right foot too, keeping my happiness meter tilting all the way to the right as well! With the left foot last year, 'the mad scientist' had instructed me to use crutches for the first two weeks in the boot to gradually increase my weight bearing, enabling me to walk the third week without any assistance. Things did not go as planned. . . 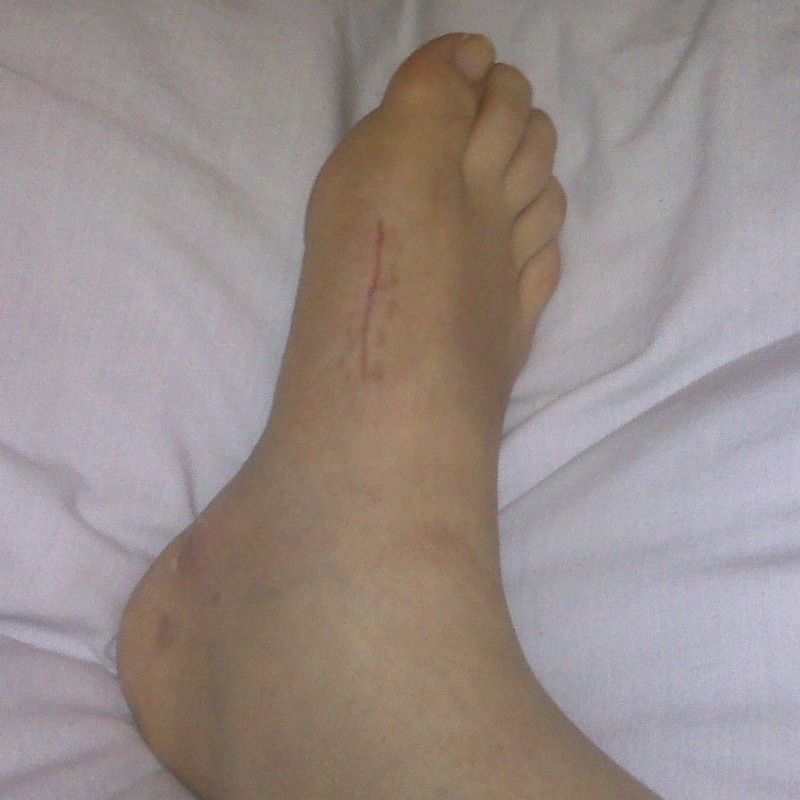 I was in so much pain that third week that I eventually had to go back to the crutches again. In preparation for this same scenario, I informed him that I would be going for the full three weeks this time around. But, it turns out I didn't need to! Thanks to some mentoring from my fantastic new therapist John, I successfully trained my foot to hit the ground after only two weeks! I'm continuing to use the cane for longer jaunts outdoors on the hard concrete, but for all intents and purposes, I am walking! Most Definitely Blog-Worthy . . . 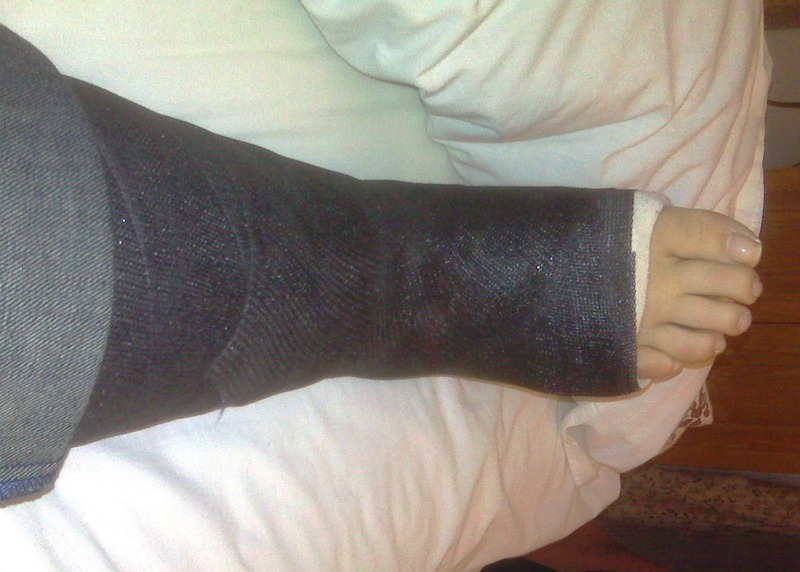 The day finally arrived yesterday to have the cast removed--yippee! And, the day couldn't have arrived soon enough; I had been sitting at home Monday night after work and suddenly smelled something rancid. After desperately searching the refrigerator and trashcan for what I swore was some seriously rotten food, I finally realized that it was my foot that was wafting something nasty toward my nose?! Luckily the nurse was still hung over from a massive case of food poisoning, so she managed to locate a handsome resident to remove my cast. After peeling off the cement and finally freeing my toes from their dark, humid chamber, I was in/out for a quick x-ray and examination from 'the mad scientist'. All he could do was go on and on about how beautiful it had turned out and how that is how a foot should look! And, I have to admit that once I got home and had the chance to scrub off all those layers of muck from the last six weeks that I couldn't believe what I was seeing! It's absolutely gorgeous--the incisions are healing nicely and will probably have minimal scarring and the swelling has remained relatively low throughout this entire process! 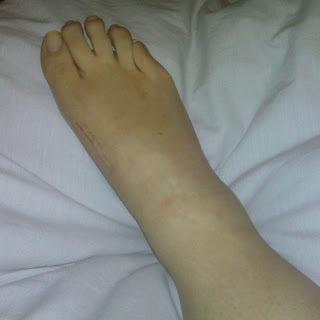 (I would post photos from last year's cast removal for comparison's sake, but I wouldn't want to frighten any of you; let's just say it was not a pretty sight.) I can already wiggle my toes and rotate my ankle freely--I couldn't do that with the left foot until we had already completed 3 weeks of physical therapy?! For whatever the reasons, this entire experience has been light years from what it was last year and I couldn't be more pleased . . .